One such visionary, Louis G. Rodier, of Springfield and Westfield, Massachusetts, thought that a graphic casting coupled with a simple and efficient adjusting mechanism would reap him fame and fortune. It certainly brought him fame, in the plane collecting circus, but the cash register rang NO SALE in the fortune ring. Like so many of Rodier's commrades in plane design, he cut his teeth in the firearms' manufactory (Smith&Wesson of Springfield, MA to be specific). The Connecticut River Valley was the technological center of the United States due to the Springfield Armory, and many a great mind learned their trade there. Rodier received a patent for his plane on March 4th, 1879. They were only manufactured (by Laflin Manufacturing Co. of Westfield, Massachusetts) for a few short years, and judging from the surviving examples, they didn't sell well at all. The planes, like so many others' patents, couldn't match those made by Stanley, which was a flourishing tool juggernaut by the time Laflin Mfg. Co put Rodier's planes into ful production during the early 1880's. Rodier's idea is to regulate the mouth and the set of the iron simultaneously and proportionately via a single adjustment. The planes have a spoked wheel adjuster that rocks the iron's bed about an axis near the throat; turning the wheel to the right reduces the iron's set by lowering the iron's pitch and consequently closes the throat, while turning the wheel to the left raises the iron's pitch to increase the iron's set and opens the throat. This same notion, coincidentally enough, was used by Leonard Bailey on his earlier bench plane designs, but it was accomplished via a different means. Rodier claimed that the ease of adjustment made it possible to convert the plane from a jack plane to a smoothing plane; i.e. a single plane could serve two functions, where the rank set of the jack and the fine set of the smoother are but a simple turn away. The lever cap, free of any embossing or other identifying marks, clamped in place by a cast thumb screw, doubles as a cap iron, although it isn't possible to position it right at the cutting iron's edge as is beneficial for fine planing. The irons of his planes, typically single Buck Brothers, are thick and parallel. Rodier made it a point to state that the plane will accept an iron of any maker provided the width and thickness are within the limits of the tool. It's strange that the plane has no markings on it anywhere to give some clue to the manufacturer. Some of the planes do have a paper label with the company's name on it, but really, how rugged is paper when subjected to everyday wear and tear that a bench plane receives? One cannot help but wonder whether Laflin Mfg. Co. was too embarassed to put their good name on the tool for fear of ridicule and scorn by businessman and carpenter alike. Rodier's planes have a real striking design to them. The sides of the plane are vertically 'corrugated' to give them strength. But, the most striking feature of his planes are the sinuous corrugations cast into the sole. Flip the plane over and it's snakes alive on his planes. 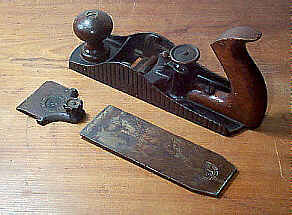 Rodier made the planes in smooth, jack, and jointer sizes. 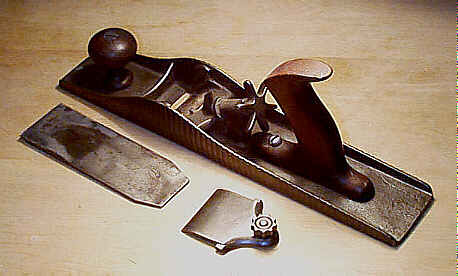 He also made a block plane version, and it's the rarest by far of his deadend design. The knob and tote are made of walnut or mahogany, with his totes of a very unique and comfortable design. A single screw, at the toe, holds the tote in place, seemingly in a mysterious manner, but removal of the tote reveals the secret of its staying power - a large cast boss of the main casting projects into the tote. There is another design of Rodier's plane that uses the same rocking frog idea, but the means to pitch the frog is a bit different from the spoked wheel desgin. A cylindrical and hollow boss (must have been a real pain to cast) sits between the mouth and the tote, directly below the iron. In this hollow boss is a stiff coiled spring. A projecting tang from the frog slips into the boss and rests atop the spring. A brass adjusting screw meets the tang of the frog, and as the screw is turned, it lowers/raises the frog through a rocking motion about its pivot point. This design is so similar to Leonard Bailey's 'vertical post' design that it seems odd that the plane would be produced, let alone granted a patent, despite Bailey's patent having expired for the design a few short years earlier. These 'vertical post' Rodier's have "L.G.RODIER'S PAT MARCH 4, 1879" embossed in circular arrangement around a star on the lever cap. This model of plane is identical to Rodier's personal prototypes, and it's a good bet that this model is the first design that was put into production. Whatever its sequence, it's by far the scarcer of the two models, with only a handful of surviving examples. are yet to high on your price for the knobs. Your lathe ought to rattle them out fast. soon. We shall expect first class handles & finish. must be exactly as the sample. Yours Truly, Laflin Manufacturing Co.
oil in with the shellac that you have on the cloth. not been varnished or shellaced since. Knobs & Handles if you can. to make them a deeper or darker color. Copyright (c) 1999-2000 by Patrick A. Leach. All Rights Reserved. No part may be reproduced by any means without the express written permission of the author.